Arrrr... It's time for the May New Release Blog Hop for The Cat's Pajamas Stamps! If you have walked the plank from the ever talented Christine, you are in the right place. If not, you will have to swab the deck back to the beginning over at Wendy's blog. This release will put you in the mood for more sun and water, and treasures to be found! There is also some new deets about our TCPTUES challenge, so keep reading! For my first card, it was made using the Beaches and Sailboat Cut Ups to create the ocean. 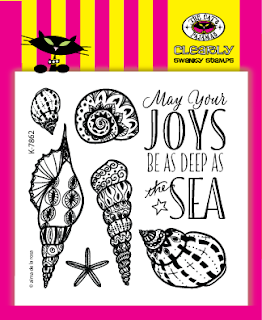 I added a few shells from the Doodled Shells set for the bottom and added the sentiment to the top. The sentiment is from the new set called Bunnies at Sea which is just the cutest! I layered different colored blue card stock for the water and some beige colored card stock for the ocean bottom. The shells were colored with watercolors and fussy cut to be popped up. The card was finished with a few pearls. 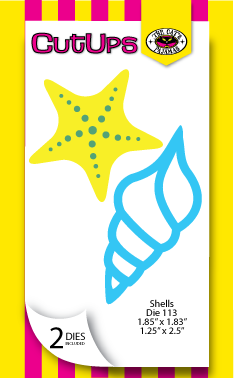 This second card was made using the sentiment from Doodled Shells and the new Shells Cut Ups. The center panel was cut using my Labels 3 Spellbinders die and layered with some patterned paper I had. I sponged the edges of the base layer while stamping the sentiment directly onto the patterned paper before layering the bottom of that with the Cut Up Shells. The card was finished with a few sequins for added sparkle. For today's TCPTUES336, here are the new details on how to play and how you can win $50 to the TCP Store!! Woot! This challenge will run from 5/30/ - 6/30 and the theme is: Sun, Sea, and Sky. If you want to play along, you just upload your design to The Cat’s Pajamas blog page using the InLinkz button by, 11:55 EDT the day before the next challenge. Thanks so much for hopping in and now you should be heading over to the blog of fabulous Nancy! Hope you have a great Tuesday! Love this design, Deborah. It has such a relaxed feel, just like to wonderful scene you've set. This card is so sea-colorful. The waves die works so well on this scene. . .a perfect one for the sentiment. Thanks for sharing this. I love the colors you used on this beachy scene. This makes me long for some beach time! As always, thank you so much for all your beautiful projects for this release! Love your beach scene with those pretty colors! Awesome waves and boat! Love the new stamps and dies! so sweet! Love the way you layered the die cuts. Terrific!